The principal government of Miyi County in Sichuan Province, China, just north of Kunming, has started construction on the first phase of a 330-hectare (1.3 square miles) new-town designed by SWA Group’s Los Angeles office utilizing historical ecologies as well as technology innovation to create a more sustainable community. One of the largest of many city design competitions won by SWA, the Anning River new-town will include higher-density housing and commercial areas as well as preserved agricultural practices, parks and recreation zones. When complete, the new South Miyi County, also known as New South Town, would be home to up to 100,000 people via new construction of 2.3 million square meters of building area and 20,000 units of housing. North Miyi is already home to 500,000 people. 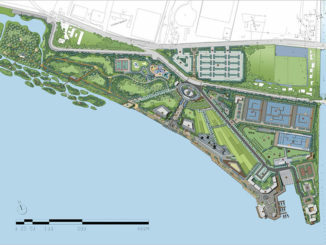 The first-phase construction on a 90 hectare area, which commenced in mid December 2009, includes outdoor programming for riverfront parks, pedestrian paths along existing irrigation canals, valley trails and a comprehensive approach to water quality. As a part of this initial phase, SWA hired Studio Shift Architects of Los Angeles to design an 18,000 square-meter museum structure, a 23,000 square-meter aquatic center, a 10,000 square-meter recreation center and 2,200 square-meter landmark observation tower providing views of the area and information on its history and natural resources. Among the project’s more innovative components is its water-quality improvement with one of the largest construction efforts of its kind using sedimentation basins, wetlands and natural water-filtration systems. Beginning at the northern end of the new town and terminating at its southern end, this gravity-fed, water quality landscape will transform the contaminated river, which has high levels of suspended solids, into a rehabilitated water resource suitable for boating and swimming. Thousands of strips of bio-film will be inserted into ponds and marshes to jump-start the filtering process of naturally-occurring wetlands. The water passes through these films of living matter and cleanses out impurities even as it encourages growth of other plants that continue the process. BioMatrix Water of Moray, Scotland, pioneered the bio-film technology, says Galen Fulford of Ecovillage Institute and lead water quality engineer on the Anning River project. “The BioMatrix approach to water quality doesn’t try to supplant the functionality or habitat creation of naturally occurring wetlands, rather it serves to enhance these systems while replacing higher maintenance solutions such as gravel filtration, and reduces the need for water-treatment plants,” said Aquino. He expects to see more and more such systems augmented by biofilm around the world, dramatically reducing the need for treatment plants. A dam being completed just north of the project boundary will bring abundant hydroelectric power, better flood control and thus spur economic development. The construction of the dam gave rise for the need to plan for South Miyi’s growth, and the regional government with assistance from SWA made it a priority to integrate growth with existing agriculture and the irrigation canals that have sustained the practice for hundreds of years. “The local government wants to plan and manage Miyi County’s growth, but also respect the cultural heritage of farming and connection to nature,” he said. “Cities of the 21st century are struggling to connect with their history, and the opportunity we are capturing in South Miyi County is to reconnect and formalize its agricultural-environmental-urban balance and avoid the mistakes of cities that were blind to the economic and ecological significance river valleys can have on the identity of a city,” said Aquino. The associated dam project will first create renewable electric energy, then secondly direct the water through a 200-meter outfall channel to allow the heated water a chance to cool down to an ambient temperature suitable for re-entering the Anning River downstream. At 80 meters wide, the outfall channel is large and visually onerous. The proposed design integrates a dynamic boardwalk system over a portion of the channel to include sections of ramp that can allow visitors a close up view of the turbulent water as it makes its way back to the river. Arup engineers are collaborating with SWA to address issues of flooding, storm water diversion strategies, water quality and levee engineering as well as providing engineering input on an SWA-designed bridge connecting the old and new towns. SWA Group is also working in conjunction with China-based design institute Tongji Urban Planning and Design on detailed controlled planning and design documents.